As no other ERIKS understands the importance of reliability and safety in a chemical production process. ERIKS offers high quality solutions, services and know-how in order to minimize disruptions and maximize safety of this process. Quality, speed and flexibility are key. Our range of products consists of many gaskets and packings fit for use under the often extreme conditions found in chemical applications such as aggressive media, high temperatures and relatively fragile flanges that require gaskets that seal with low surface pressure. Examples of gaskets that can be applied in these situations are our various PTFE gaskets and packings known for being highly chemically resistant or graphite that can be used in high temperature applications. 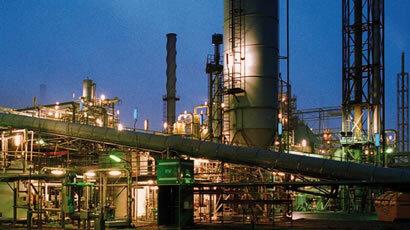 ERIKS has years of experience in the delivery and processing of rubber products. 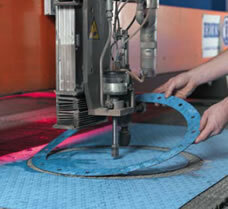 Rubber sheets and gaskets are used in a wide variety of machine and equipment constructions. Our Elastomet gaskets are often used in plastic piping applications. ERIKS has various types of flange guards in different materials available. The caps offer protection in case of a blow-out and preventing leakage of (aggressive media), warranting the safety in your plant. In addition to gaskets and packings, ERIKS delivers a wide range of flange accessories. Our product range includes bolts, nuts, leak search spray and liquid gaskets. ERIKS endorses the importance of a timely delivery and technically competent service. We have an extensive product range with leading brand names in sealing technology and our private label RX® on stock. Our various production locations for soft- and metallic gaskets enable us to deliver your products in a short period of time, 24 hours a day, 7 days per week. Even products with non standard dimensions have short delivery times because they can be manufactured at our own facilities. When it comes to urgent delivery or quick supply we will not let you down. You can also benefit from our experience with large projects such as shut downs. Examples of our support are complete shut down containers, packaging per equipment set, rack jobbing and technical support on site. As a result, the smooth supply of gaskets and packings warrants the continuity of the maintenance and stock expenses are limited. Our rapid delivery options and flexible logistic systems can provide you with considerable savings. Contact us or visit www.easyordersystem.com.